Hui-Ming Cheng, Editor-in-Chief of Energy Storage Materials, presenting the plaque to Professor Jeff Dahn. Materials Today is delighted to announce that Professor Jeff Dahn from Dalhousie University, Canada, has won the 2016 Energy Storage Materials Lecture Award, which is awarded by the journal Energy Storage Materials. 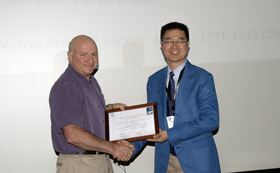 The Editor-in-Chief of Energy Storage Materials, Hui-Ming Cheng, presented the plaque to Professor Jeff Dahn at the Carbon 2016 held in State College, USA, on July 12, 2016. The award, which is sponsored by Elsevier, gives special recognition to a person who has accomplished outstanding achievements in energy storage materials and devices. Professor Dahn is recognized as one of the pioneering developers of the lithium-ion battery that is now used worldwide in laptop computers and cell-phones. Dahn's recent work has concentrated extending the lifetime of lithium-ion batteries so they last decades. He is the author of over 610 refereed journal papers and co-inventor of 65 inventions with patents issued or filed. He has an H-index around 88. Jeff Dahn has always interacted strongly with industry. He took up the NSERC/3M Canada Industrial Research Chair in Materials for Advanced Batteries at Dalhousie University from 1996 to June 2016. In June 2016, Dahn began a 5-year exclusive research partnership with Tesla Motors. Jeff has received numerous awards including: International Battery Materials Association (IBA) Research Award (1995); Herzberg Medal, Canadian Association of Physicists (1996); ECS Battery Division Research Award (1996); Fellow of the Royal Society of Canada (2001); ECS Battery Division Technology Award (2011), and the Yeager Award from the International Battery Materials Association (2016). He was awarded the inaugural Governor General Innovation Award (Canada) in May, 2016. Prof. Aldo R. Boccaccini receives "Arthur L. Friedberg Ceramic Engineering Tutorial and Lecture Award 2016".